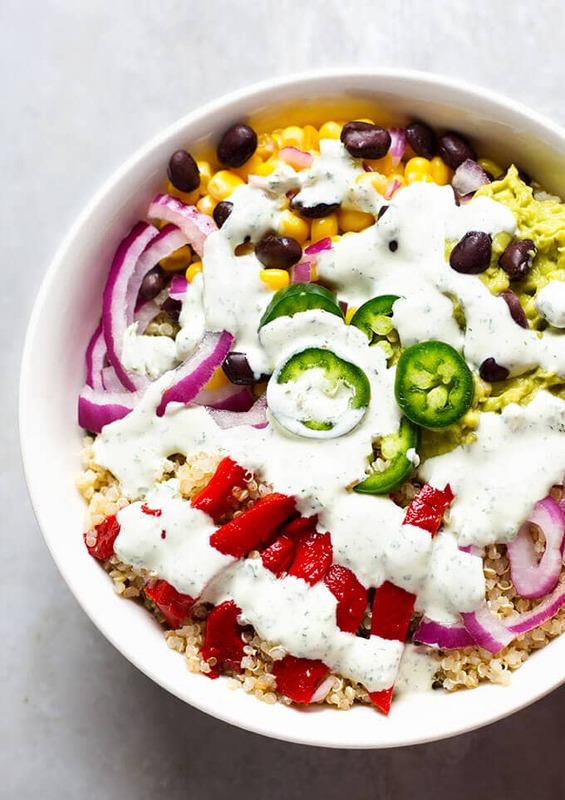 This very delicious Southwest Quinoa Bowl with Cilantro Dressing might surprise you. It is healthy and full of Tex-Mex flavor. Perfect for a weekend lunch, or make it the day before and grab for a work lunch. Grain Bowls are super popular. We used to call it Rice Salad, back in the day. We hadn’t discovered quinoa yet. In the last 5 years I have tried many new (to me) foods. Here are some highlights: Goji Berries. Hmmm. I wasn’t in love with them, but the hype was about how healthy they are. I tried disguising them in smoothies, salads, oatmeal, and even a muffin. Nope. I just couldn’t get past their unique flavor, that I still can’t describe. Chia Seeds. Love them, and use them in smoothies and pudding, overnight oatmeal, and even meatloaf, though Paul thought I had gone a little too far. Don’t mess with the man’s meatloaf! Quinoa was one of my favorite new foods. I love it in soups, and mixed with rice, with gravy, in salads, and grain bowls, of course! Even though it is technically not a grain, but a seed, let’s not split hairs. It’s delicious, healthy and versatile! The Cilantro Dressing takes this Southwest Quinoa Bowl over the edge of flavor amazingness! You will have leftover dressing, and I encourage you to use it for dipping my Sweet Potato Steak Fries in. Or save it for tacos! 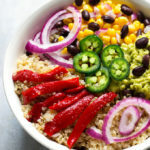 Southwest Quinoa Bowl with Cilantro Dressing is a hearty healthy grain bowl packed with amazing flavors! So easy to put together, and you will love the dressing! Add quinoa, water, and salt to a boil in a small saucepan. Reduce the heat to low, cover, and cook for 15 minutes. Take pan off of heat and let sit for 5 minutes. Remove lid and fluff quinoa with a fork. Quinoa is done when it looks translucent and you can see the germ (the little sprout). Add dressing ingredients to a mini food processor and pulse several times, until ingredients are well chopped and blended. When Quinoa has cooled (you can serve it warm, but I don’t recommend hot), put quinoa in a bowl. Mash the avocado with the salt and lime juice. 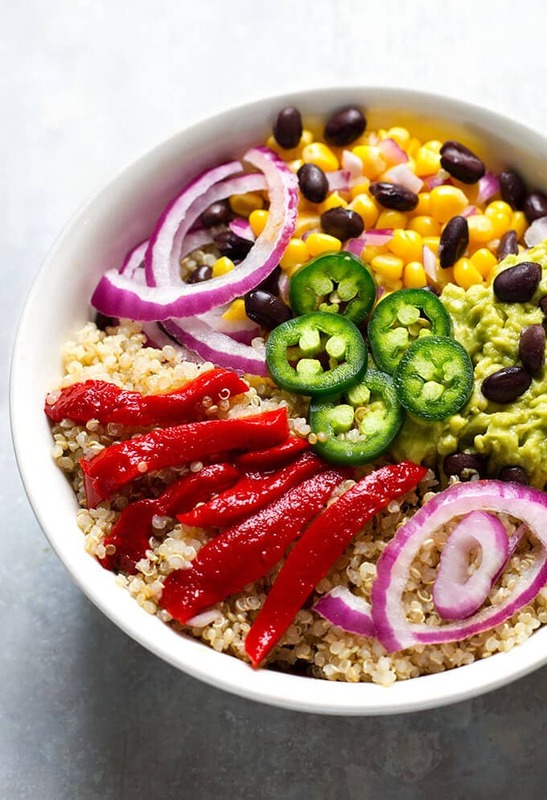 Place in bowl with quinoa. Add the corn, onion, black beans, and roasted red pepper to the bowl. Drizzle with the cilantro dressing and garnish as desired. This looks soooo good- love it as a nice hearty lunch that will actually keep my full until dinner time. Definitely saving! Thanks Karly! It is so delicious, and it will definitely fill you up! This salad bowl was so delicious and filling! Oh my goodness, that cilantro dressing! My favorite of the year! Hi Gail! It’s one of my very favorites, too! So many flavors going on, and it’s healthy!